Feature: Tales from a Robert Pattinson Premiere – The Nuge. 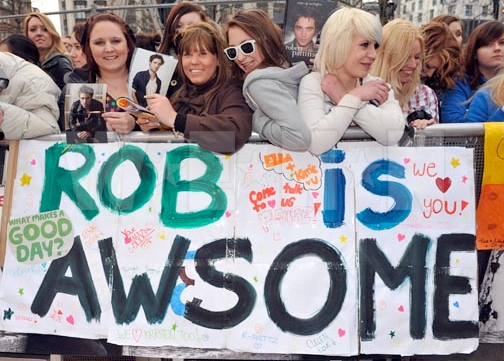 None of this has deterred Robert Pattinson’s loyal fans, who are out in full force today. I was here to attend a press conference with Pattinson, his co-star Emilie de Ravin and producer Nick Osbourne. I arrive a little early and try to take in the insane atmosphere. Premieres in Leicester Square usually attract a moderate crowd of autograph hunters hoping to spot a famous face, but it’s rare you get a gathering of this scale or fervour. The huddled mass of fans, predominantly composed of young women, resemble some sort of sprawling, loosely organised army, drunk with lust and excitement, all baying for even a distant glimpse of their well-groomed hero, flailing cameras in the air. A banner draped over the barrier reads “We Camped Out For 32 Hours To See Rob!” One of the PR ladies tells me there was already a sizeable crowd when she arrived that morning at 9am. Few young stars have inspired such mania as Pattinson has, and its quite extraordinary to witness this mania first-hand in its rawest, most primal form. Every time a car drives up to the entrance of the Odeon Leicester Square, the crowd lets out a wild scream of anticipation, usually followed by a disappointed sigh when someone ugly and non-famous appears. The crowd is so large that it stretches round a corner, meaning that those on the outskirts can’t really see what’s going on, and like a wild herd of wilderbeast in a stampede, each wave of screams spreads a frenzy of confused hysteria. When R-Patz (as the inane celebrity magazines have dubbed him) finally arrives, I worry that the welcoming scream will leave some lasting damage to my ears. Pattinson, flanked by two enormous security guards, is gracious and friendly, happy to sign autographs. Soon I see a girl, no more than about 16, walk away with an autograph in hand; she is trembling and looks close to tears. Later, a woman yells something in Spanish down her mobile, literally jumping up and down in excitement. Passers-by look on, bemused. We are kept waiting for an hour or so while Pattinson signs more autographs, to the grumbles of some of the attendees, and then after a lot of nervous shuffling from the security detail, Pattinson and co-star de Ravin arrive, followed by producer Osbourne. Pattinson seems only slightly overwhelmed given the immense reception he’s been given, but he’s also giggly and effusive and is in good spirits. He looks like he’s enjoying the experience, which is fair enough; it’s hard to think of a more undiluted self-esteem boost than having three thousand people chant your name. The press conference lasts less than an half an hour and no great truths are imparted, at least none that have not already been covered by the gossip mags. The actors wax lyrical about the script – Pattinson admits he read “tons and tons of scripts after Twilight, literally hundreds” but felt this was “more naturalistic” than the others. They praise their veteran co-stars Pierce Brosnan and Chris Cooper who play their respective fathers – Brosnan, unsurprisingly, is “very very charming”. They both agree that the reaction of the fans is “the most important thing”. There’s a slightly awkward moment when Pattinson misinterprets the question “do you have a hero?’ to mean “do you have anyone who thinks of you as a hero?” It could be slightly telling of the enormous ego massage that this young star has received to construe a question in this way, and he smiles with careful, deliberate modesty: “I don’t think I’ve ever been looked at as a hero”. But it’s a relatively innocent mistake; the questioner repeats his question and Pattinson answers both the mistaken and intended questions with good grace. There follows a chummy discussion between de Ravin and Pattinson about Marmite and its Australian equivalents, and then a jokey ‘and finally…’ question on what the two stars’ favourite biscuit is. Here’s a world exclusive for you: Robert Pattinson likes Hobnobs. And then they’re off, almost as quickly as they arrived. The security detail shuffle nervously again, barking at the press to remain seated until the area is cleared for safety, or something (the writers from Glamour magazine presumably pose a potential terror threat). Pattinson and de Ravin wave goodbye and thank us for our time. A version of this article originally appeared on ObsessedWithFilm.com.